This isn't so much a product review as an ingredient review, as I'm sure 88% or more of you know about Kiehl's Creme de Corps. In brief, it's an incredibly thick body lotion that claims to be "non-greasy" and to leave "skin soft, smooth and beautifully moisturized." Kiehl's also says that its Creme de Corps is "enriched with the finest skin-nurturing ingredients known to Kiehl's for a rich, elegant skin texture." Let's talk about Kiehl's reputation. I've been curious about Kiehl's since my early teenage years, when I read Seventeen and all of the teen mags that I later discovered basically make money by pushing products. But hey, all I knew was that a slew of celebrities praised Kiehl's Lip Balm #1! When I finally sampled it in-store at about age 16, I realized it was little more than glorified Vaseline. Kiehl's, at least to me, has always had a really apothecary-like image. One that seems rooted in both history and science. Its prices are ... pricey, and its packaging is basic -- old-fashioned, even. Its products are generally fragrance-free, or without fragrance additives, and sometimes it can smell downright plasticky or medicinal. 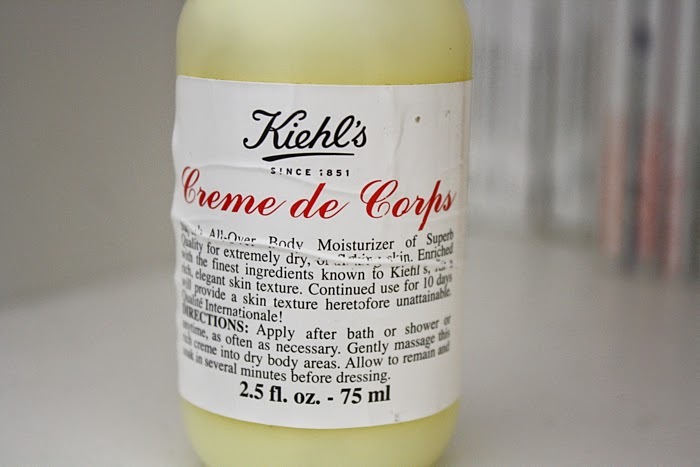 I got my hands on the famous Creme de Corps (one of Kiehl's best-selling products, as far as I know) in a Black Friday 2012 "Helping Hands" gift box I ordered for myself for $25. Typically, the 2.5 fl ounce Creme de Corps retails for $11, but I received it along with a 2.5 fl ounce Ultimate Strength Hand Salve (retail price: $15), a 1 ounce Creme de Corps Soy Milk and Honey Body Polish (2.5 ounces goes for $11), and a teeny tiny vial of the Midnight Recovery Concentrate (1 fl ounce goes for $46). Along with the box, I received a number of deluxe-sized samples with the Black Friday deal: a 1 ounce tube each of the Ultimate Strength Hand Salve and the Creme de Corps, and another tiny vial of the Dark Spot Corrective Serum. On top of that, I received typical packet-sized samples of the Ultra Facial Cream and the Ultra Facial Cream with SPF. All this for $25 and shipping and handling. Needless to say, I was disappointed. As for performance, this product (unfortunately) performs as it says it will. It is among the best moisturizers I've tried for itchy, dry skin. It has a plasticky scent and is quite difficult to spread (and to absorb), but once it absorbs, it "cures" itchy, dry skin for up to 24 hours (or the next shower). Worse, the bottle the lotion lives in is truly impractical, as you lose a ton of product. The plastic is so thick that you couldn't possibly squeeze the bottle, and it's pretty much not an option to cut the bottle up to dislodge any remaining precious dew. Kiehl's, you guys have been in the business for a while -- why not a small tub? I almost wish this product didn't work so well, because a) it contains so many ingredients I'm trying to avoid, and b) it's not cheap. I'm not planning to repurchase in the future, but there may come a day when I can't find anything that works as well and I will have to reconsider.